Mainly clear. Low 36F. Winds NE at 10 to 15 mph.. Mainly clear. Low 36F. Winds NE at 10 to 15 mph. An annual winter elk count showed Yellowstone's Northern Range herd has grown. Cow elk numbers have increased to the point that Montana Fish, Wildlife & Parks will recommend an increase in antlerless elk harvest. In the wintertime elk are a key food for wolves in and around Yellowstone National Park. A bull elk halts traffic inside Yellowstone National Park this spring as it crosses the road between Mammoth Hot Springs and Tower Junction. A group of young bulls stands back from a larger bull bedded down with a group of cows in the Gardiner Basin. The Northern Yellowstone elk herd, one of the most famous and closely watched in the world, is finally growing at a healthy clip. An annual winter aerial survey conducted by Montana Fish, Wildlife and Parks and Yellowstone National Park biologists counted 7,579 elk over two days in January, up a whopping 42 percent from last winter’s 5,349 elk. The sizeable increase over last year is likely due to the inconsistency in the ability to see animals from the air, said Karen Loveless, an FWP biologist based in Livingston who flies part of the survey area. Studies have shown the accuracy of aerial counts can vary from 65 to 90 percent, depending on conditions. The Northern Range elk herd is so well-known because it is the main source of food for Yellowstone National Park’s wolves. The herd had swelled to more than 19,000 by 1994, but when wolves were reintroduced in 1995 elk numbers began to decline as wolf populations grew on a steady diet of elk meat. More elk for wolves meant fewer for hunters and hunting outfitters, some of which have been loud critics of the wolf reintroduction and FWP’s resulting elk management decisions. In years past the agency reduced cow elk hunting permits to help rebuild the herd and then cropped the bull elk hunt. In 2016 the Fish and Wildlife Commission agreed to shorten the elk hunting season in the district north of Yellowstone, Hunting District 313, by two weeks in order to protect migrating elk. For the first time this fall, FWP even instituted a temporary closure during the fall hunting season to protect migrating elk that were caught in a hail of gunfire as they left Yellowstone near Gardiner. Now FWP is a victim of its own successful management policies. With elk numbers up, Loveless said the agency has recommended increasing the cow elk harvest in the southern portion of Hunting District 317 — the northeast side of Paradise Valley — and the northern edge of HD 316 to push elk away from private lands and onto the adjoining national forest and Dome Mountain Wildlife Management Area. The recommendation would allow a limited shoulder season hunt extending into February for holders of 300 antlerless B licenses. The licenses would only be valid on private land. “Increasing harvest pressure and continuing it into the postseason may help if we can discourage them from getting into those (cattle operations),” Loveless said. Elk are known carriers of brucellosis, a disease that can cause cattle to abort. FWP has been working to keep elk and cattle separated, especially during the spring elk calving season since birthing material carries the brucella bacteria. Within HD 313 alone — an area that extends from Gardiner north to Six Mile Creek — 5,738 elk were counted, the highest number since 1999. FWP’s objective for the hunting district is between 3,000 to 5,000 elk, a figure based on landowner tolerance. Most of those elk — 3,750 — were gathered north of Dome Mountain in a large mass. “On the northwest side of Dailey Lake, that whole bench was a sea of elk,” Loveless said. 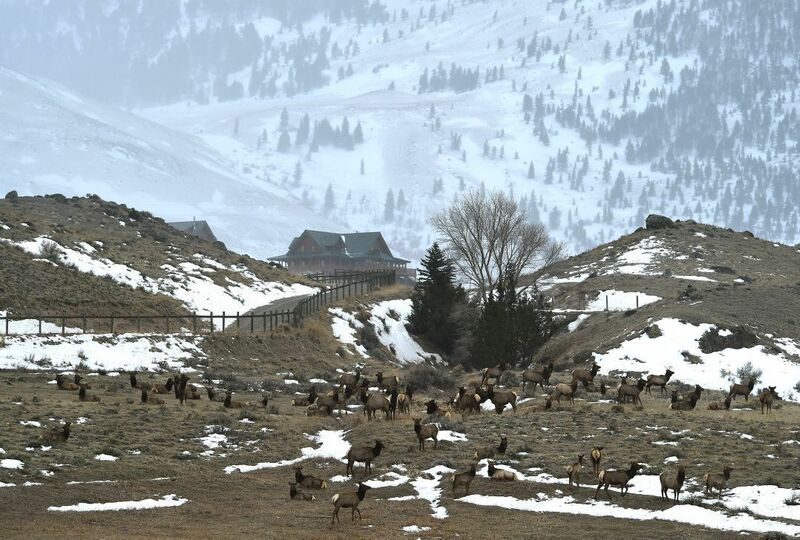 Another 1,988 elk were spread across the southern portion of the district closer to Gardiner. The 20-year average for that area is 957 elk. It’s estimated that 76 percent of the Northern Range herd migrated out of the park into Montana. That’s down from last year when 89 percent pushed north, but still high. Increased elk migration could be due to a number of factors, including: more bison on the Northern Range so more competition for food, avoidance of a predator-rich environment; a decrease in hunter pressure near the northern border that in the past may have turned elk back into the park. The winter survey looks at population trends while a survey in March will examine the herd’s composition, such as calf recruitment and bull to cow ratios. Still, Loveless did count 130 brow-tined bulls in HD 313, representing 2.3 percent of the elk observed, although sightability was considered poor. Inside the park an additional 390 brow-tined bulls were spotted, for a total of 520 brow tined bulls across the Northern Range, or 6.8 percent of all the elk counted. This year’s elk count is the highest in 13 years. In 2005, 9,545 elk were counted. The long-term average since elk counts began in 1976 is 10,634 elk. The herd counts bottomed out in 2014 at about 2,000 elk. Just north of the HD 313 boundary in the Emigrant Peak area, Loveless counted 695 elk, many of which are likely associated with the northern Yellowstone elk herd. Sixty brow-tined bulls were among those elk.